Yesterday, inflationists were out in full force after the Producer Price Index (PPI) release. The Producer Price Index for Finished Goods rose 1.4 percent in January, seasonally adjusted, the U.S. Bureau of Labor Statistics reported today. This increase followed a 0.4-percent advance in December and a 1.5-percent rise in November. In January, at the earlier stages of processing, prices received by manufacturers of intermediate goods climbed 1.7 percent, and the crude goods index jumped 9.6 percent. On an unadjusted basis, prices for finished goods moved up 4.6 percent for the 12 months ended January 2010, their third consecutive 12-month increase. History shows that attempts to predict consumer prices from jumps in producer prices is fraught with error. Commodity prices reflect record stimulus efforts globally, led by US and China. Year over year comparisons were very easy to beat after the 2008 plunge in commodities. Looking ahead one can say the same thing looking in the rear view mirror. Unless energy prices continue soaring, and I doubt they will, PPI comparisons will be easy to beat in reverse. Yesterday may have been the last hurrah for rising energy prices. Regardless, consumer prices are a better tell for the deflationary environment we are in. Inquiring minds are reading Consumer Prices Increase Less Than Anticipated. The cost of living in the U.S. rose in January less than anticipated and a measure of prices excluding food and fuel fell for the first time since 1982, indicating the recovery is generating little inflation. The consumer-price index increased 0.2 percent for a fifth straight month, led by higher fuel costs, Labor Department figures showed today in Washington. Excluding energy and food, the so-called core index unexpectedly fell 0.1 percent, reflecting a drop in new-car prices, clothing and shelter. Retailers such as Wal-Mart Stores Inc. have reduced prices to lure customers at a time when most employers are reluctant to hire. Restrained inflation will allow Federal Reserve policy makers to keep the benchmark interest rate close to zero to help support the recovery. Even with higher production and material costs, U.S. companies are reluctant to pass on the expenses to consumers. Wal-Mart, the world’s largest retailer, reported fourth-quarter sales yesterday that trailed its projection after cutting grocery and electronic prices. Regardless of how traders or China affect commodity prices, the bottom line is consumers remain unable and/or unwilling to spend. Certainly 14.8 million officially unemployed consumers are not buying much. Nor are an additional 2.5 million "marginally attached workers" nor are 8.3 million part-time workers who want a full time job. Marginally attached workers are those who want a job but are not counted as unemployed because they did not look for a job in the last 4 weeks. There is no reason to believe employers are about to go on a hiring spree. Indeed there is every reason to believe they won't. Thus pricing power will remain weak. 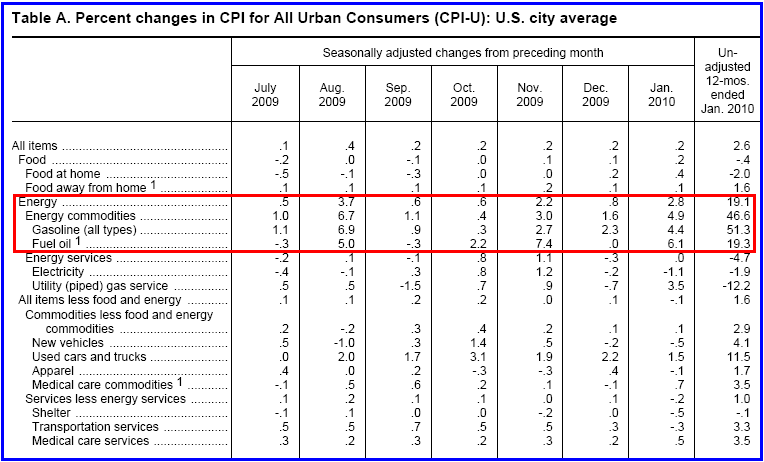 With that backdrop let's investigate the official Consumer Price Index Release For January 2010. On a seasonally adjusted basis, the January Consumer Price Index for All Urban Consumers (CPI-U)rose 0.2 percent, the U.S. Bureau of Labor Statistics reported today. Over the last 12 months, the index increased 2.6 percent before seasonal adjustment. 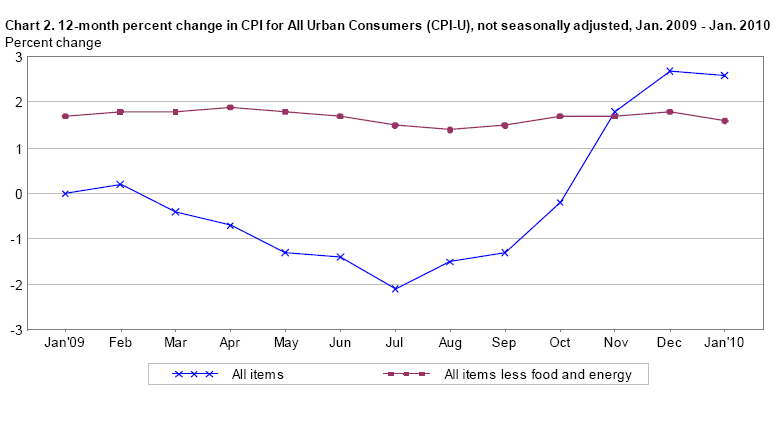 The seasonally adjusted increase in the all items index was due to a rise in the energy index. An increase in the gasoline index was the main factor, and the indexes for fuel oil and natural gas rose as well, though the electricity index declined. The index for all items less food and energy fell 0.1 percent in January. This decline was largely the result of decreases in the indexes for shelter, new vehicles, and airline fares. In contrast, the medical care index posted its largest increase since January 2008, and the index for used cars and trucks increased significantly for the sixth month in a row. Note that last column in red, on energy prices. Don't expect that trend in energy prices to last. It won't. Year over year comparisons were easy to beat on the upside with crude at $35 and they will be easy to beat on the downside when crude reverses. The above charts reflect the heroic efforts of the Fed and central bankers to reflate. In spite of the Fed's efforts and the stimulus efforts from Congress such as cash-for-clunkers and $8,000 tax credits for houses, home prices are weak, rent prices are falling, and prices of new cars are dropping. Given that Owners Equivalent Rent is the largest component of the CPI (I think housing prices should be, not rent prices), there is going to be downward pressure on the CPI. If the price of crude drops, and I think it will, expect to see a renewed bout of the entire CPI-U negative, this time with the core CPI in negative territory as well. Today, the market appears to be cheering the fact that the Fed can hold off on rate hikes for much longer. The proper way to look at things is the Fed's reflation efforts have failed, interest rates are at zero with no room to cut, and hawks are increasingly vocal. When this matters is anyone's guess, but the fact remains this is simply not a good backdrop for equity prices. Mike Shedlock / Mish is a registered investment advisor representative for SitkaPacific Capital Management . Sitka Pacific is an asset management firm whose goal is strong performance and low volatility, regardless of market direction. Visit Sitka Pacific's Account Management Page to learn more about wealth management and capital preservation strategies of Sitka Pacific. I do weekly podcasts every Thursday on HoweStreet and a brief 7 minute segment on Saturday on CKNW AM 980 in Vancouver. When not writing about stocks or the economy I spends a great deal of time on photography and in the garden. I have over 80 magazine and book cover credits. Some of my Wisconsin and gardening images can be seen at MichaelShedlock.com . © 2010 Mike Shedlock, All Rights Reserved.